A plan to create a single-payer healthcare system that is currently under consideration in the California Legislature would cost $400 billion annually to implement, according to a legislative analysis released by the Senate Appropriations Committee on Monday. By comparison, California’s proposed budget for the upcoming fiscal year is approximately $180 billion. In order to cover healthcare and administrative costs, California could redirect $200 billion of existing federal, state and local funds toward the single-payer system. However, the state would need to raise another $200 billion from tax hikes, according to the analysis. 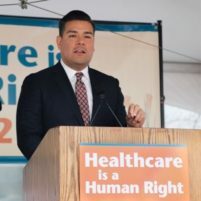 SB 562, a bill introduced by state senators Ricardo Lara (D-Bell Gardens) and Toni Atkins (D-San Diego), calls for creating a Medicare-style health system for all California residents, including illegal immigrants. If adopted, California would become the first state in the country to institute a single-payer system. Under the proposal, private insurers would be replaced with a state agency that would function as an insurance company, paying doctors and hospitals when people seek treatment. Residents who currently receive insurance through employers would received coverage through the state. The legislative analysis states the single-payer proposal would likely reduce spending by employers and employees statewide, which currently ranges from $100 billion to $150 billion a year. However, the analysis says there is tremendous uncertainty about how the single-payer healthcare system would function. At the California Democratic Party convention over the weekend, the issue of single-payer healthcare received considerable attention. Progressives, including hundreds of nurses, railed for a single-payer system, while some party officials expressed doubt over whether the state would be able to fund the plan. Last month, SB 562 passed the Senate Health Committee on a 5-2 vote. State Sen. Bill Monning, who represents San Luis Obispo County, cast one of the votes in favor of the single-payer bill. On Monday, the Senate Appropriations Committee voted unanimously to place the bill in its suspended legislation file. So Gavin Newson, our current Lieutenant Governor of California has created a committee to run for Governor of California in 2018 and has focused on making this the center point for his election as our next governor. Where in the hell is the Chamber of Commerce in this State? They are doing NOTHING to protect the business community and cave in to the Democrat Agenda weekly. They need to disband in this State or start earning their dues. Why don’t we just provide healthcare for the entire world? I”m sure we can get the California elites to pay for it without an ounce of protest. Oh wait a minute… they will only spend someone else’s money. This will not happen for one simple reason. Our democrat dominated CA government has no problem taking over healthcare and taxing the populace into poverty. But this will not happen because the government employees would end up with the same healthcare coverage as the poor people, and government will never reduce their own personal benefits package. They will just exempt themselves from this new regulation just as they do for most laws, regulations, rules, morals, and common sense.